Our nation’s network of rivers, lakes, and streams originates from a myriad of small streams and wetlands, many so small they do not appear on any map. Yet these headwater streams and wetlands exert critical influences on the character and quality of downstream waters. The natural processes that occur in such headwater systems benefit humans by mitigating flooding, maintaining water quality and quantity, recycling nutrients, and providing habitat for plants and animals. This paper summarizes the scientific basis for understanding that the health and productivity of rivers and lakes depends upon intact small streams and wetlands. 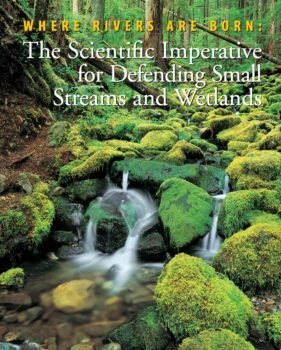 Since the initial publication of this document in 2003, scientific support for the importance of small streams and wetlands has only increased. Both new research findings and special issues of peer reviewed scientific journals have further established the connections between headwater streams and wetlands and downstream ecosystems. Selected references are provided at the end of the document. Historically, federal agencies, in their regulations, have interpreted the protections of the Clean Water Act to broadly cover waters of the United States, including many small streams and wetlands. Despite this, many of these ecosystems have been destroyed by agriculture, mining, development, and other human activities. 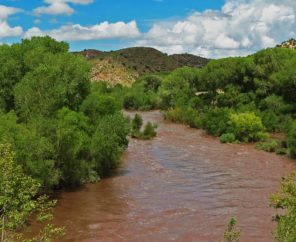 Since 2001, court rulings and administrative actions have called into question the extent to which small streams and wetlands remain under the protection of the Clean Water Act. Federal agencies, Congress, and the Supreme Court have all weighed in on this issue. Most recently, the Supreme Court issued a confusing and fractured opinion that leaves small streams and wetlands vulnerable to pollution and destruction. We know from local/regional studies that small, or headwater, streams make up at least 80 percent of the nation’s stream network. However, scientists’ abilities to extend these local and regional studies to provide a national perspective are hindered by the absence of a comprehensive database that catalogs the full extent of streams in the United States. The topographic maps most commonly used to trace stream networks do not show most of the nation’s headwater streams and wetlands. Thus, such maps do not provide detailed enough information to serve as a basis for stream protection and management. Scientists often refer to the benefits humans receive from the natural functioning of ecosystems as ecosystem services. The special physical and biological characteristics of intact small streams and wetlands provide natural flood control, recharge groundwater, trap sediments and pollution from fertilizers, recycle nutrients, create and maintain biological diversity, and sustain the biological productivity of downstream rivers, lakes, and estuaries. These ecosystem services are provided by seasonal as well as perennial streams and wetlands. Even when such systems have no visible overland connections to the stream network, small streams and wetlands are usually linked to the larger network through groundwater. Small streams and wetlands offer an enormous array of habitats for plant, animal, and microbial life. Such small freshwater systems provide shelter, food, protection from predators, spawning sites and nursery areas, and travel corridors through the landscape. Many species depend on small streams and wetlands at some point in their life history. A recent literature review documents the significant contribution of headwater streams to biodiversity of entire river networks, showing that small headwater streams that do not appear on most maps support over 290 taxa, some of which are unique to headwaters. As an example, headwater streams are vital for maintaining many of America’s fish species, including trout and salmon. Both perennial and seasonal streams and wetlands provide valuable habitat. Headwater streams and wetlands also provide a rich resource base that contributes to the productivity of both local food webs and those farther downstream. However, the unique and diverse biota of headwater systems is increasingly imperiled. Human-induced changes to such waters, including filling streams and wetlands, water pollution, and the introduction of exotic species can diminish the biological diversity of such small freshwater systems, thereby also affecting downstream rivers and streams. Because small streams and wetlands are the source of the nation’s fresh waters, changes that degrade these headwater systems affect streams, lakes, and rivers downstream. Land-use changes in the vicinity of small streams and wetlands can impair the natural functions of such headwater systems. Changes in surrounding vegetation, development that paves and hardens soil surfaces, and the total elimination of some small streams reduces the amount of rainwater, runoff, and snowmelt the stream network can absorb before flooding. The increased volume of water in small streams scours stream channels, changing them in a way that promotes further flooding. Such altered channels have bigger and more frequent floods. The altered channels are also less effective at recharging groundwater, trapping sediment, and recycling nutrients. As a result, downstream lakes and rivers have poorer water quality, less reliable water flows, and less diverse aquatic life. Algal blooms and fish kills can become more common, causing problems for commercial and sport fisheries. Recreational uses may be compromised. In addition, the excess sediment can be costly, requiring additional dredging to clear navigational channels and harbors and increasing water filtration costs for municipalities and industry. The natural processes that occur in small streams and wetlands provide Americans with a host of benefits, including flood control, adequate high quality water, and habitat for a variety of plants and animals.